NASA Transformation - Universe Galaxies And Stars Section. NASA vision for human space exploration. NASA Administrator Sean O'Keefe announced a series of changes to the agency to better prepare it to fulfill President Bush's new vision for human space exploration; to "make it leaner and more focused on its goals." NASA will merge seven existing enterprises into four mission directorates, to create clearer lines of communication and authority: Exploration Systems, Space Operations, Aeronautics Research, and the Science Directorate. Further changes are on the way. 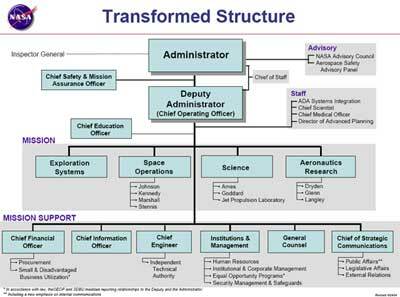 In the latest of what will be ongoing briefings, Administrator Sean O'Keefe today announced a transformation of NASA's organization structure designed to streamline the agency and position it to better implement the Vision for Space Exploration. In a report released last week, the President's Commission on Implementation of U.S. Space exploration Policy found, "NASA needs to transform itself into a leaner, more focused agency by developing an organizational structure that recognizes the need for a more integrated approach to science requirements, management, and implementation of systems development and exploration missions." "Our task is to align Headquarters to eliminate the 'stove pipes,' promote synergy across the agency, and support the long-term exploration vision in a way that is sustainable and affordable," said Administrator O'Keefe. "We need to take these critical steps to streamline the organization and create a structure that affixes clear authority and accountability." Two agency-wide priorities will continue with direct responsibility for all related activities across NASA. NASA functional offices will be restructured as Mission Support Offices. Headquarters and field center offices will be aligned to improve communications and responsibility. The agency will also redefine its relationships with the NASA Field Centers by developing clear and straightforward lines of responsibility and accountability. Specific Mission Associate Administrators will be assigned as Headquarters Center Executives. They will have oversight of field center performance in implementing agency policies and programs. The Associate Administrator for Institutions and Management will address field center infrastructure concerns. The changes outlined today become effective August 1, 2004. They represent the next step in implementing the recommendations of the President's Commission on Implementation of U.S. Space exploration Policy and reflect NASA's ongoing efforts to apply the findings and recommendations of the Columbia Accident Investigation Board across the agency. Over the next several weeks, the Administrator will engage teams in each NASA location to provide front line guidance on implementing their early stages of the transformation plan. The discussions will be the precursor for a renewed commitment to mission success and excellence in an employee-centric organization. "This transformation will be an evolutionary process, exploring new ways to move forward and implement change. We'll also be engaging other government agencies, industry, academia and the international community to assist us in developing the tools and processes we need to successfully advance the Vision for Space Exploration," added Administrator O'Keefe. "Doing so will enable us to take the next bold steps into space and rekindle the innovation and entrepreneurial skills that is our legacy to humankind."